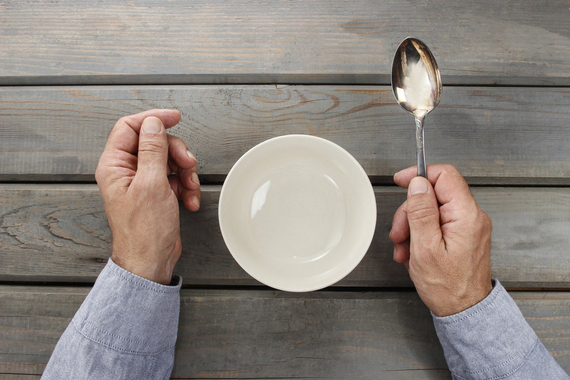 As November is National Caregiver Month, I wanted to shine a light on a topic that caregivers and their loved ones are facing at increasing rates, but that very few people are talking about in public -- senior malnutrition. As November is National Caregiver Month, I wanted to shine a light on a topic that caregivers and their loved ones are facing at increasing rates, but that very few people are talking about in public - senior malnutrition. The sheer number of malnourished elderly adults is truly staggering. One in three patients who are admitted to the hospital are affected by this condition. Patients diagnosed with malnutrition have a length of stay three times longer than those who do not arrive in a state of malnutrition. Patients who are malnourished prior to undergoing surgery have a 4 times higher risk of developing a pressure ulcer during the healing process as well. The annual burden of disease-associated malnutrition in the US is currently an overwhelming $156 billion. My goal is to help draw attention to this under-recognized, and unfortunately underdiagnosed, problem, and to provide solutions on the best way to avoid the onset of malnutrition in you or your loved one. Malnutrition is diagnosed when certain changes in weight and functionality are present in an individual. There are a variety of causes of malnutrition, such as poor dentition, difficulty swallowing, decreased appetite, and lack of access to foods for adults on a lower income, which can result in reduced intake of foods and nutrients. Over time, this leads to fat loss and even more importantly, muscle loss due to poor nutrient intake of vitamins and minerals. All of these factors combined over a period of time can lead to malnutrition. For a person experiencing malnutrition, the most common health problems include unintentional weight loss, tiredness, fatigue, muscle weakness, loss of strength, poor memory, depression, anemia, and a weakened immune system. It is also possible for a patient to experience weight gain as a diet of low nutrient but high calorie foods can lead to fat gain while muscle is being lost. If you are curious if you or your loved one is malnourished, try this personalized mini-nutrition assessment tool that you can fill out to ensure that malnutrition is addressed. If you do find someone is malnourished, it's a good idea to visit a clinic or your physician to address this issue before too much time passes. Normally, hospitals screen new patients who are admitted for malnutrition by asking a few key questions. These include inquiring about recent weight loss - with an indication of how much weight they have lost in what span of time - as well as changes in appetite. If the patient answers positively, to these questions, they may be at risk for malnutrition and will be seen by a medical professional - usually a physician and a dietitian - to assess their weight status and whether or not malnutrition might be present. Patients are also often screened by the hospital based on their Body Mass Index (BMI), with BMIs less than 18.5 flagging the patient as underweight and usually triggering the need for assessment by a dietitian. The Joint Commission - the organization who is responsible for ensuring most hospitals in the US are compliant with a group of standards for hospital care - published an article stating that reducing malnutrition is now a national goal. According to McKee in 2006, patient malnutrition has been referred to as the "skeleton in the hospital closet". This condition is often unrecognized and untreated, even in the hospital setting, despite being a prominent risk factor for increased rate of complications, longer hospital stays, higher readmission rates, and increased mortality. A variety of new rules and regulations created by the collaboration between The Joint Commission and the American Society for Parenteral and Enteral Nutrition (ASPEN), along with many others, have helped to ensure that malnutrition is now more likely to be picked up by clinicians in the hospital setting. Obvious significant muscle wasting, loss of subcutaneous fat. Nutritional intake of < 50 percent of recommended intake for 2 weeks or more (as assessed by dietitian). Bedridden or otherwise significantly reduced functional capacity. Weight loss of > two percent in one week, five percent in 1 month, or 7.5 percent in three months. Some muscle wasting, loss of subcutaneous fat. Nutritional intake of < 50 percent of recommended intake for 1 week (as assessed by a dietitian). Weight loss of >one to two percent in one week, five percent in one month, 7.5 percent in three months. Food intake < 50-75 percent of normal in the preceding week. Weight loss less than that listed for Malnutrition of a Moderate Degree. There are other causes and criteria for diagnosing malnutrition - and it's a good idea to talk to your doctor if you or your loved one loses a large amount of weight following a surgery or as a result of a condition that causes inflammation or acute disease. If you do find that someone you care about is malnourished, there are many steps you can take in order to address the problem. First, bring this topic up with your physician, and encourage foods that you know your loved one already enjoys. See if they might need a trip to the dentist to re-fit their dentures, and make sure they have easy-to-grab snacks on hand for between meals. Plan a social meal a few times a week, because after all -no one really likes to eat alone all the time. When assessing diet, the key macronutrient that needs to be addressed is ensuring adequate protein intake. Protein-rich foods such as chicken, fish, beef, pork or and eggs require preparation time and care to avoid food borne illness. Many times, this is viewed as just too much work. It is much easier to just graze on crackers, bread, pretzels or other low nutrient foods that are quick and convenient. We require adequate protein levels at all stages of our lives. As we age, the rate of muscle breakdown increases compared to the rate of new muscle synthesis (rec work on medical jargon). Elderly people require a higher level of dietary protein to avoid muscle loss which leads to weakness and difficulty with activity of daily living like getting up out of chair or getting up off of a toilet. Similar to protein, the best sources of fiber also require some prep time and are found in vegetables, fruits and whole grains. It is important to encourage your loved one to eat, but it's equally important that they are eating nutritious foods with protein, fiber and healthy fats. All of these are typically absent in the right combinations in convenience foods. Making foods taste good can go a long way to helping your loved one eat better and more regularly to help prevent the risk of malnutrition. Use spices and herbs to season foods, and lemon juice to add a little brightness to the dish. The best way to avoid malnutrition is to take steps to avoid it. Make sure you talk to a health professional in order to reduce the risk of malnutrition for yourself and for your loved one. For a host of great, top-quality information and resources for caregivers, check out AARP's Caregiving Help and Advice portal.